This is for a quad tree with polygon to polygon, polygon to circle, and circle to circle collision tests. Quad Tree Tester is available for play online. Use the mouse to move the polygon around the screen. Use [Space] to toggle turn on/off the use of quad tree to see the difference in performance. Use [S] to toggle stationary objects on/off. This is a remake of Killer Comet from the back of the VIC20 manual. You are the defender trying to keep the comet from colliding with the Earth! Blast away the comet piece by piece until its gone or you fail and it smashes down into the Earth. There are three comet sizes and three comet speeds available to play in. Do you think you have what it takes to defend the Earth from the Krashing Comet? Krashing Comet is available for play online. To pause the game, press the [Esc] key. Use the arrow keys to navigate the menus and space bar to select the option. 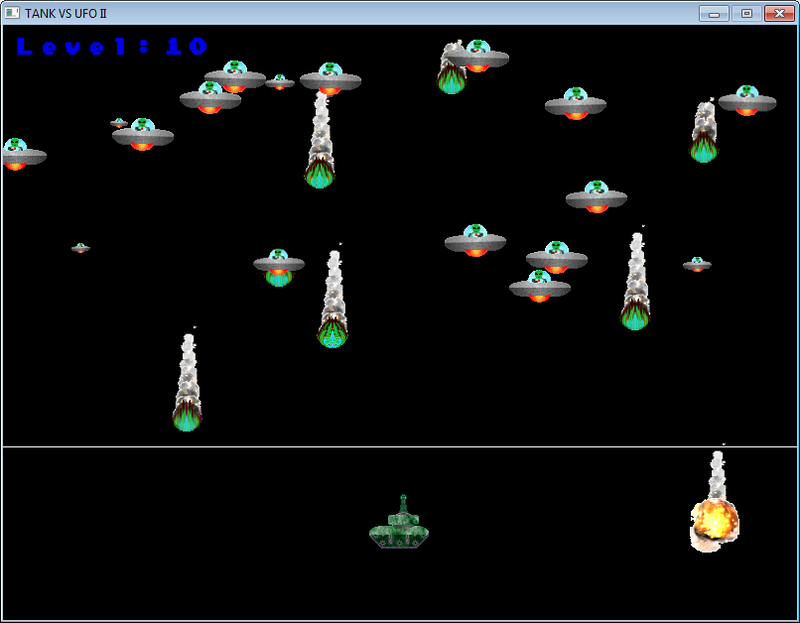 Use the Left/Right arrow keys to move the ship and Space Bar to fire. Waves of UFOs are invading the planet! 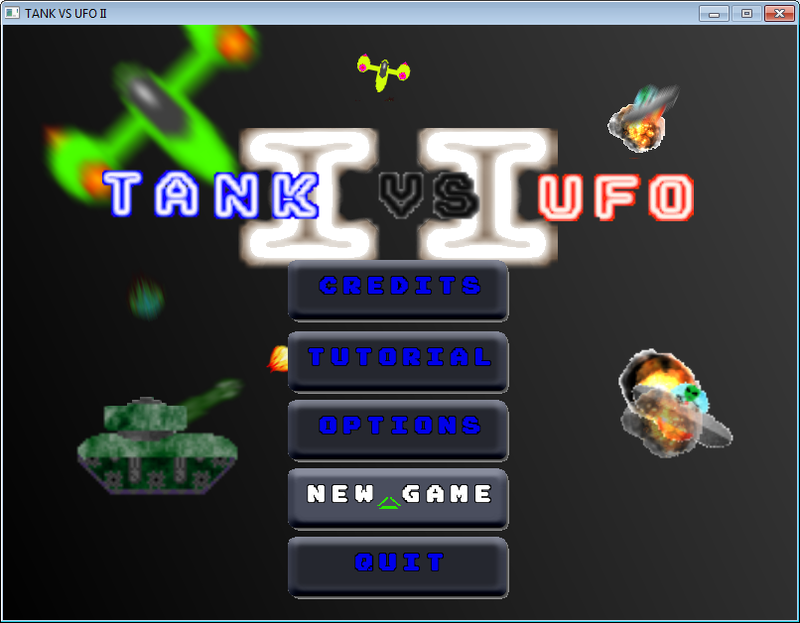 You are in control of a tank to blast them from the sky and keep the planet from being over-run by aliens! This round, I will be using Monkey, so it will be a little while before I post the next revision. Stay tuned! To leave the credits or the game play screens, press the [Esc] key. Follow the tutorial to learn the gameplay. 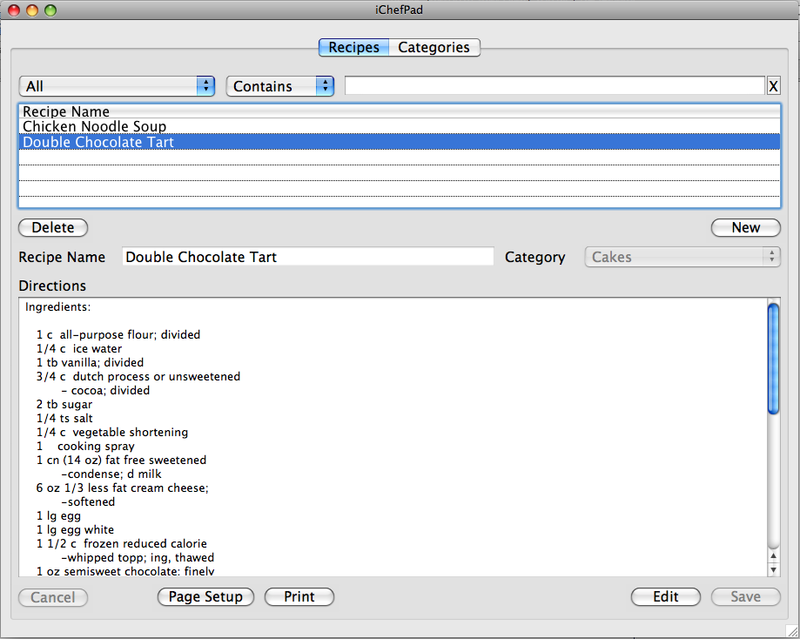 Ever wanted to store and organize all your recipes somewhere and then easily find any of them within seconds whenever you needed them? Look no further, iChefPad easily allows you to do just that! 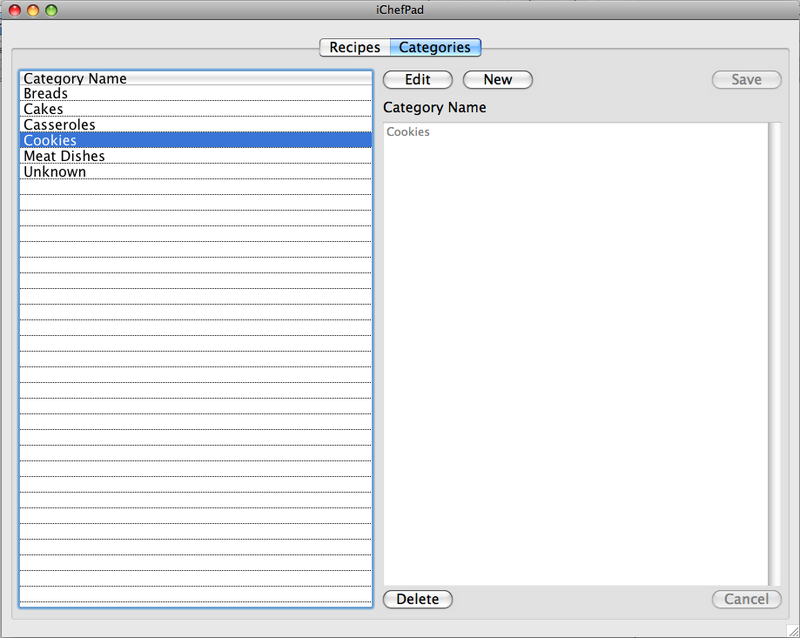 Use Categories to organize your recipes! I grew tired of guessing what animations would look like only to find out that they look bad when I place them in the game and I didn't like messing my code up while testing samples. A buddy and I were messing around with a game and realized an app to handle this would be nice to have. So... 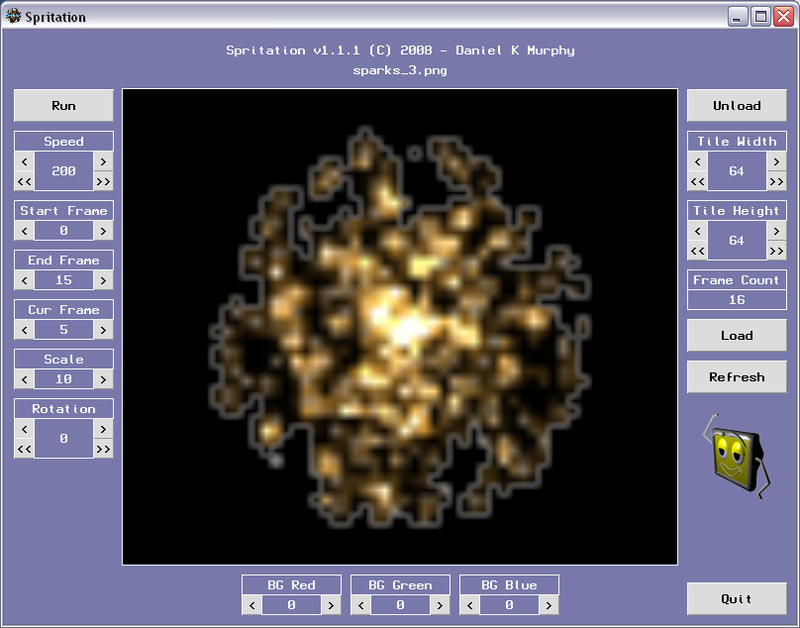 I thought a bit about it and wanted something to sample the animation sequences, thus Spritation was born! This app will load BMP, JPG, and PNG. Mac version does only JPG and PNG. All the features are displayed in the screenshot above. Review the ReadMe file for use. My first scroller game / work in progress. 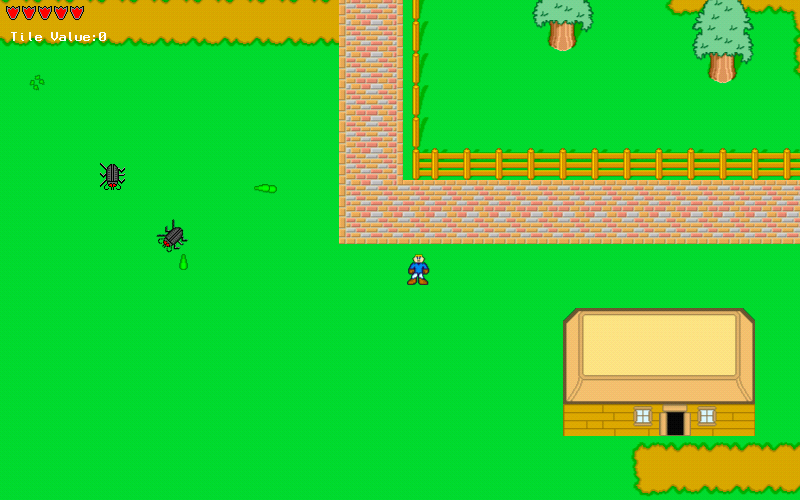 This basically is my attempt at a 2D World Editor using tiles. I wanted something I could use for game development that would be easy and fun to generate world maps. There are many tools similar to mine, but I wanted specific features and capabilities that I didn't find elsewhere, or had some of them with limited capabilities. Ultimately, I really just wanted to develop my own tools! So far, it has been rather fun! The major factor for developing this tool was to have a tool like this to run on Windows, Linux, and Mac OS. I wanted the same capability no matter which platform I was on. Sure, there are cross platform designers, but again, this was something I wanted to create. 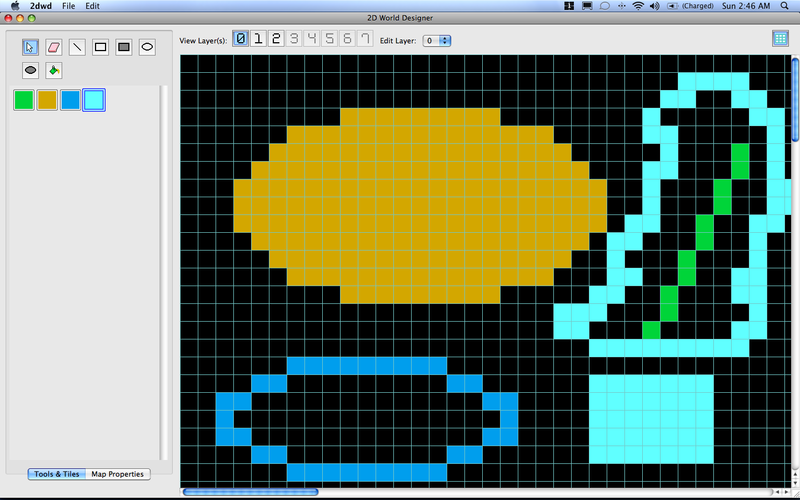 I am currently developing this under Mac OS X first. I will from time to time build it under the other two operating systems, but you can expect the fastest development in Mac OS. NOTE: WDF format is curently under redesign. This will be a feature I will add in towards the end of the list of things to do. I want to get the tools implemented and features that make the designer useful enough to be an easy tool to work with. This decision will help keep me on task. It's stable enough to allow editing full maps with up to 8 layers each. I've tried it at 8 layers with 10,000 by 10,000 tiles where it seemed to be ok with it. Keep in mind that the Windows and Linux versions basically run, and I have not spent any real development time with either platform. Please let me know on my forum for 2DWD what you find not working right. You can always place suggestions or comments there as well! Please use my forum for reporting issues or wish lists! Below is a screenshot of the test "game" I made to test out the WDF file format and the designer itself. Its proving capable, but it needs work! So far, it is loading the file then rendering it on the screen. You can move around with the arrows. ESC will terminate it.